Interstate 14 is the Central Texas Corridor, following U.S. 190 from Brady east to Killeen, Temple, Bryan-College Station, Livingston and Woodville and SH 63 between Jasper and the Sabine River. Potential extension of the corridor may take the route west to San Angelo and IH 20 at Midland-Odessa. A 25 mile section of the route between Fort Hood and IH 35 was already built to Interstate standards, while the remainder requires future construction or upgrades to existing U.S. 190. 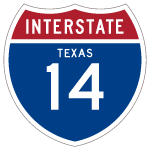 The Texas Transportation Commission announced on January 27, 2017 that the 25-mile stretch of U.S. 190 between U.S. 10 Business at Copperas Cove and Interstate 35 at Belton was officially designated Interstate 14. Completed of sign installation was slated for August or September of 2017, with guide sign changes taking place afterwards.13 The initial signs for IH 14 however were unveiled on April 22, 2017. Establishment of IH 14 along the 25-mile stretch of U.S. 190 from U.S. 190 Business in Copperas Cove eastward to IH 35 was officially submitted for the May 24, 2016 AASHTO Special Committee on U.S. Route Numbering (USRN) meeting.12 The USRN however rendered a negative decision for Interstate 14, deeming the number unacceptable and opting to work with Texas on another number choice. The Central Texas Corridor proposal for Interstate 14 ties into the original 14th Amendment Highway Corridor proposed in 2004. Proposed by U.S. Rep. Max Burns and other legislators in 2004 along with the 3rd Infantry Division Highway (Interstate 3), the 14th Amendment Highway, or Interstate 14, was envisioned to run west to Austin, Texas, and east to Myrtle Beach, South Carolina, thus creating a “Gulf Coast Strategic Highway.” Under this scenario, to connect properly with the nearby Interstates, Interstate 14 would continue west from Natchez to Alexandria, Jasper, College Station, and Austin.5 To the east, Interstate 14 would extend east into South Carolina, where it would connect with Interstate 20. The new freeway corridor would follow U.S. 84 from Louisiana into Mississippi through Natchez, Brookhaven, Laurel, and Waynesboro before entering Alabama. Once in Alabama, the route will follow U.S. 84 east to Grove Hill, then angle northeast via Clarke County Route 35 toward Camden. At Camden, the freeway would turn east again via Alabama 28 and Alabama 21, connecting with Interstate 65 east of Hayneville via Lowndes County Route 26. From that point, Interstate 14 would merge with Interstate 65 north to Interstate 85 north, possibly using the planned Alabama 108 / Montgomery Outer Bypass freeway. Near Tuskegee, Interstate 14 would branch off Interstate 85 and follow U.S. 80 east to Phenix City and enter Georgia at Columbus. Following the existing U.S. 80 and bypass of Columbus, Interstate 14 would turn south on Interstate 185, then southeast on U.S. 27-280/Georgia 1. Interstate 14 would then split east along Georgia 26 at Cusseta, then continue east along Georgia 26, meeting Interstate 75 in the vicinity of Perry, where it would meet up with Georgia 96 and the Fall Line Freeway Corridor (Georgia 540 / High Priority Corridor 6). Interstate 14 would then turn northeast through Warner Robins and connect with Georgia 88 via a new route between Irwinton and Sandersville. From there, Interstate 14 would travel northeast via Georgia 88 and U.S. 1/Georgia 4 to meet Interstate 520 in Augusta. At Augusta, Interstate 14 could continue east over the Savannah River, and it would follow Interstate 520 northeast to end at Interstate 20 in South Carolina. Interstate 14 is referred to as the “14th Amendment Highway.” This name honors the 14th Amendment of the U.S. Constitution, which provides for equal rights to all persons in the United States, which is of particular importance in the Deep South, through which I-14 would traverse. Even though Interstates 10 and 20 are somewhat nearby, the act further states that “disparity in transportation infrastructure investment has been a key contributing factor to the persistent poverty and social ills of this region. The lack of adequate east-west Interstate highway access has provided a significant impediment to travel throughout the region, served as a severe obstacle to the attraction of industry and jobs, and has been a detriment to public health and transportation safety.” The last paragraph of Section 2 of the Act resolves that Interstate 14 should be constructed through the historic Southern Black Belt. The 14th Amendment Highway Corridor report delivered to Congress on February 3, 2012 specified a 600 mile route for Interstate 14. The corridor would run from Natchez, Mississippi east to Montgomery, Alabama and Columbus, Macon and Augusta in Georgia. The route between Macon and Augusta would tie into Interstate 20 near Exit 183 or Interstate 520 near Fort Gordon. This 100-mile stretch would involve new highway construction through Milledgeville, Sandersville and Wrens to connect with I-520 (Bobby Jones Expressway). Those portions of Proposed Interstate 14 that overlay U.S. 80 would be part of High Priority Corridor 6: U.S. 80 from Meridian to Macon. The corridor along Louisiana 28 between the Sabine River and Alexandria is a part of High Priority Corridor 75 while 2015 legislation designated the corridor across Texas as High Priority Corridor 83. U.S. 190 combines with Interstate 35 south from Temple to Belton. The west split between the two is the planned eastern terminus for Interstate 14 presently. Photo taken 09/28/07. Interstate 14 will overlay the U.S. 190 freeway leading west from Interstate 35 at Exit 294A. An incomplete directional T interchange joins the two routes at south Belton. Photo taken 09/28/07. The Interstate standard stretch of U.S. 190 originates east of Copperas Cove along Fort Hood in central Texas. Craig, Jeremy, “Interstate 3 and Interstate 14,” July 26, 2004, personal email from an Augusta resident. Craig, Jeremy, “RE: Interstate 3 and Interstate 14,” November 6, 2004, personal email from an Augusta resident. Congressman Charlie Norwood Webpage: I-3, I-14 Initiation Bills Approved By U.S. House of Representatives (03/10/05) http://www.house.gov/apps/list/press/ga09_norwood/InterstatesApproved.html. Proposed I-14 highway would span from Wilmington to Texas, WWAY-TV3 (ABC Affiliate), May 25, 2006. 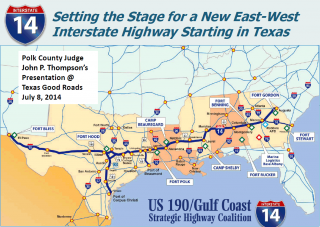 “Local cities want to turn U.S. Highway 190 into an interstate.” KXXV-TV25, November 7, 2013. “Reports Details Plan For New Interstate.” Augusta Chronicle, The (GA), February 15, 2012. “Re: Hwy 190 from Copperas Cove to Belton to be renamed I-14” online posting by Grzrd, AARoads Forum, October 14, 2015. “House ready to approve $325 billion highway bill.” Jamie Dupress’s Washington Insider, November 5, 2015. “US 190 to Become I-14.” KCEN, December 8, 2015. Special Committee on U.S. Route Numbering meeting scheduled for May 24, 2016, agenda packet, AASHTO 2016 Spring Meeting in Des Moines, Iowa. 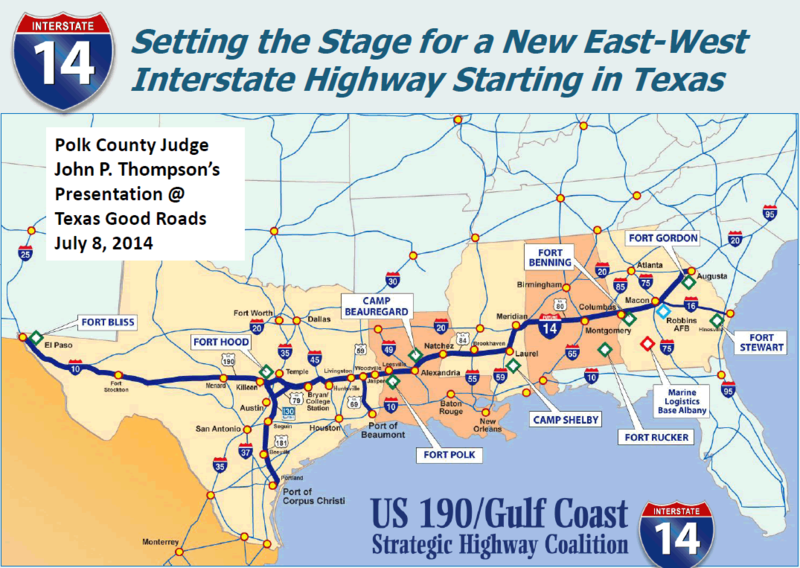 “Highway 190 is officially Interstate Highway 14 from Cove to Belton.” Killeen Daily Herald. January 26, 2017.